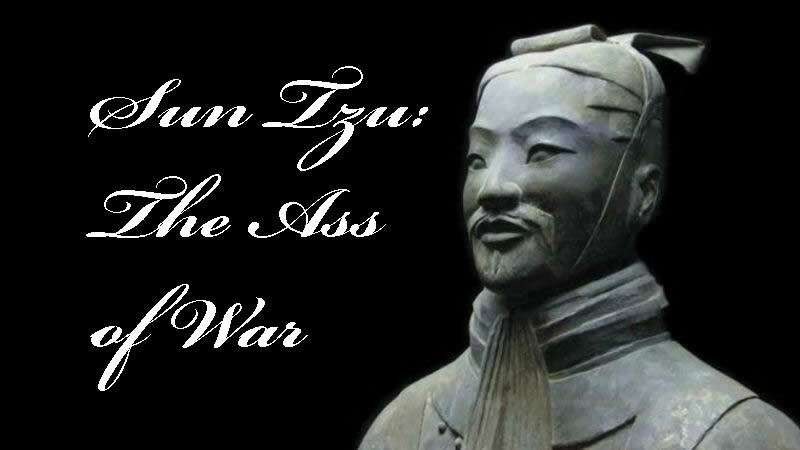 Sun Tzu, whose book, The Art of War, was written some 2,500 years ago during a period of constant war, and popularized in the West some 100 years ago (just in time for industrialized warfare), is the leading example of what’s wrong with digging up ancient platitudes as guides for action today in the areas of war and peace. This “wisdom” provides nothing to the modern warmonger on his own terms, and even less to the advocate for peace; yet it’s imagined to be relevant to both, to create common ground for both, and to embody deep timeless meaning. Read that solemnly as if discovering amazing new insights. If you can, you are a better war artist than I. “The anti-war movement needs to study the philosophies of those who have mastered the art of conflict, from Caesar to Napoleon, from Sun Tzu to Clausewitz,” says Scott Ritter. And Paul Chappell tells us that the U.S. military is learning from the common wisdom of Sun Tzu and Gandhi. Yet, as Chappell points out, the lesson that war should be avoided doesn’t work for a war-making institution and cannot be applied to a permanent hostile occupation. Sun Tzu imparts the following wisdom: It’s better to capture a country intact than to destroy it in the process. (Chorus: Ahhhhh! Ooooooooh!) But countries are not captured on the 21st century global game board. Occupations are not tolerated. In Sun Tzu there are nine types of ground to fight wars on: your own ground, ground a short distance into foreign territory, ground that’s advantageous to either side, open ground, intersecting highways, the heart of the enemy’s territory, difficult terrain, ground that’s hard to get to, and desperate ground where a fight for survival is immediately required. None of which is of the least value to the U.S. Air Force or the U.S. peace movement. In an updated version the U.S. military would have the following nine types: ground with men, women, children, and a government to be overthrown; ground with men, women, children, and a government to be propped up; ground with men, women, children, and both a government and its resistance to be destroyed; ground with men, women, children, and suitable for demonstrating new weapons; ground with weapons customers to be spared; ground with oil or opium production to be spared; ground with the risk of killing white people; ground with anti-aircraft weaponry; ground with nuclear missiles. The world is too different, war is too different, and peace is too much unlike war for Master Sun to help us. Yes, of course, Chappell is right that avoiding war is still better than fighting war. Yes, of course, Ritter is right that a peace movement should think strategically. But the models for such thinking most likely to help us are those of successful nonviolent movements that have changed cultures, not ancient sages who tell us not to attack while the enemy is in a river. This bunk doesn’t even help us as metaphors to which we attribute insights we already had. What does that add to our knowledge? Or, rather, what does it take away? That’s the problem. There is some actual content in Sun Tzu’s scribblings, and it is disastrous and incompatible with ending war or making peace. Sun Tzu’s entire effort is based on the idea that war can be done right. When a “progressive” senator like Al Franken or congressman like Tom Perriello tells you that the 2003-present war on Iraq “should have been done right” in order to “win,” they are being perfect war artists. But “winning” doesn’t actually exist anymore as a state of affairs that can be described. One doesn’t win the bombing of people’s towns. One keeps doing it or quits doing it. That’s all. Yet Sun Tzu fans will tell you that the key to “winning” is to keep everything secret, to lie about everything, to deceive constantly, and to use “diplomacy” as a servant of war. Unless you leak our f#^%!@7%9*! emails you g^%$#d%^&* $@$!$%!O(!! “Be subtle! Be subtle! and use your spies for every kind of business. This is still widely believed in an era with no more battlefields, no more battles fought with swords or chariots, no more battles in which the casualties are mostly soldiers. And even those who question war, and even those who question vicious punishments for whistleblowers, rarely question the very idea of secrecy or the idea on which it is based, namely enemies. But secrecy vanishes without enemies, and enemies vanish without war — war as a permanent state of mind, even among people who mouth aphorisms about how it’s better to avoid a fight if possible. The only way to prevent dueling is to know how to duel better than your enemy. The only way to prevent slavery is to know how to enslave better than your enemy. The only way to prevent blood feuds is to know how to feud better than your enemy. The more you learn and prepare for war, the more wars you fight. Sun Tzu says to avoid prolonged warfare, and be sure to loot and pillage to support your army. But a global empire must be in permanent war, and you could loot and pillage the poor countries of a dozen earths and never fund Lockheed Martin. Peace activism requires prolonged struggle and the opposite of looting and pillaging. The Pentagon’s updated list goes into the hundreds. What does this piddly little contribution of five add? But a peace movement really does not gain by trying to determine who or what to attack with fire. Should a peace movement be strategic? Obviously. It’s been telling itself as much for decades with never a single voice of dissent whatsoever. But lying, deceiving, acting swiftly before quitting, and burning everything with fire is all wrong. Special forces is all wrong. Secret ancient wisdom is all wrong. Sun Tzu claims that he who knows himself and his enemy and so forth shall win. And then he claims that by knowing which side is stronger he can predict which will win. This is muddled nonsense, but clear recognition that one side’s knowledge guarantees it nothing. One side’s commitment to always lying and deceiving guarantees it only the eternal absence of peace. A peace movement, to succeed, needs human and financial resources, it needs truth and credibility, it needs masses of people, it needs the ability to communicate a worldview that rejects the maintenance of enemies, it needs relentlessness and endurance. It needs to take on winnable struggles against specific policies while advancing the broader goal of a world beyond war. It does not need to think of peacemaking as warmaking. It does not need to destroy, intimidate, or trick the major enemy that is popular acceptance of war. It needs to eliminate enemies by making them allies. It needs to maneuver facilitators of war against it without thinking of them as people who should be attacked with fire.